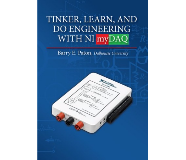 These hands-on experiments cover a wide range of topics including analog and digital circuits, sensors and signal processing. The experiments are designed from a full-system perspective, integrating software and hardware solutions for a complete learning experience . Students will find these project-based labs not only entertaining in style but also comprehensive in content. The experiments highlight the many useful features of myDAQ while developing the students problem solving abilities. Once students have tried these experiments, they may find themselves tinkering and creating their own unique electrical systems. Students will reinforce their understanding of analog and digital systems. Students will develop confidence in their analytical skills when working on projects with mulitple systems. Students will improve data acquistion skills by using many different sensors throughout the lab. Resistors are the most common component found in all electrical and electronic circuits. This lab demonstrates how to use myDAQ to measure resistance R, current I, and voltage V.
The second most common component after resistors in electronic circuits is the capacitor. This lab explores the magnitude, frequency, and phase of capacitors and demonstrates how to visualize and measure these parameters. There are many kinds of electronic locks using keypads, finger prints, retina scans, or voice recognition, but the lab will create one using hand motions. Using an IR distance sensor, students will measure the distance from the sensor to a hand. Surging through the heart of microprocessors are digital pulses, single pulses, bursts of pulses, and wave trains of pulses. This lab uses myDAQ to measure pulse counts, count/second, or the pulse length. An infrared photogate will be built and used to measure the speed and acceleration of a small toy race car hurtling down a track. We live in a digital world where music, pictures, and control algorithms are all stored as digital bits. 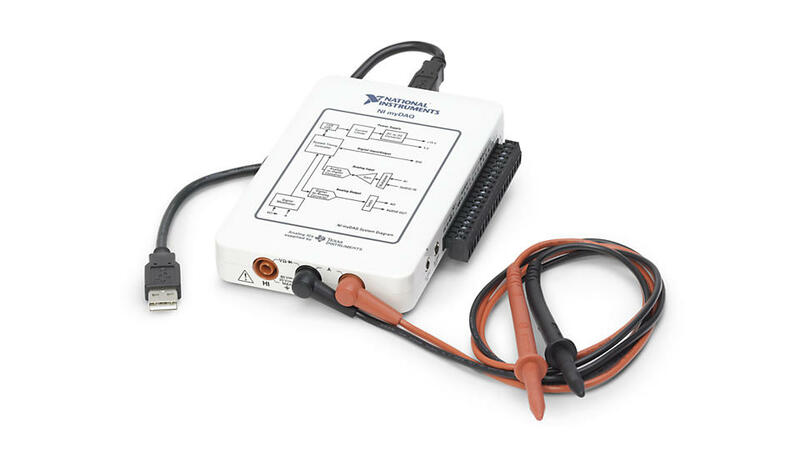 This lab shows how to use myDAQ to communicate with inputs and outputs. Students will begin with simple IO tasks and then lead up to successive approximation technique, a common algorithm used in most ADC chips. This lab shows how to use the myDAQ 8-bit port to read 16 switches arranged in a 4 x 4 matrix. A LabVIEW program converts the switch pressed into a byte containing the row and column address. This byte is then converted into a 4-bit binary encoded nybble, which in turn is converted into a single ‘LED’ indicator in the same position as the switch. Thus students are able to create the classic game of Simon Says. This Lab uses the analog output of myDAQ to generate an audio signal from a LabVIEW keyboard of one or two octaves. In the following exercise, students will build an external audio amplifier to drive an 8 ohm speaker. Then students inspect Fourier transform to analyze the relationship between discontinuities in a waveform and the quality of music. In college, a group of students and professors get together to build a beer bottle symphony. 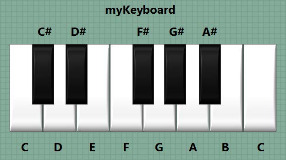 Beer bottles of various sizes and shapes are used to generate the notes of a scale. This lab uses myDAQ with a microphone to tune a bottle partially filled with water to a specific note. Using LabVIEW and an amplification circuit students, will explore and manipulate sound signals. This lab uses myDAQ and components to build a karaoke circuit. Students will remove the vocals from their favorite songs first using op amps and then using LabVIEW. 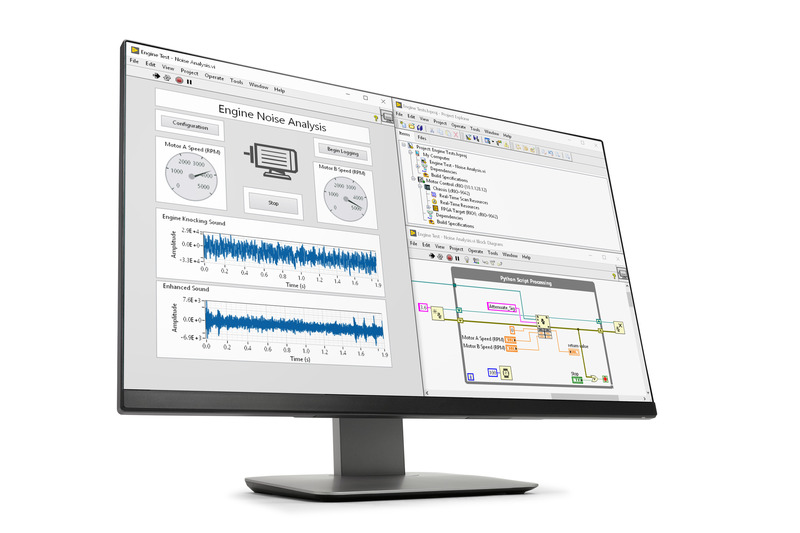 This lab highlights the power of software defined systems compared to analog circuit methods. The Theremin was the first electronic musical instrument. It had two antennae which were part of resonant RLC oscillators. Students will use myDAQ and two optical sensors to build an Optical Theremin with its own unique sound.